It’s amazing what people can find to make delicious food. Who would have thought that the root or rhizomes of the lotus plant which is submerged in muddy-like waters in ponds or lakes can be very delicious indeed? Some have used it in stir-fries with sweet peas and baby corns. Some cook soup with it. One popular chinese-style soup is the Lotus Root Soup with Red Dates and Peanuts. You can even add dried cuttlefish for added flavour. After hours of simmering, it tastes robust and is apparently good for your body. It tastes even better if it is cooked using charcoal fire. 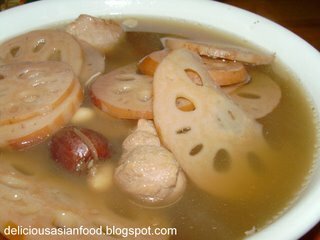 This is my recipe for Lotus Root Soup with Red Dates and Peanuts. Boil water in pot. Upon boiling, add pork ribs. Remove layer of scum on surface of boiling water. After about 2 minutes of rapid boiling and having removed scum, add the rest of the ingredients and bring to boil again for 2 minutes. Cover lid, reduce heat to low and simmer for 3 hours. Add salt to taste before serving. Ohhh I love lotus root soup. Like you, sometimes I add cuttlefish too! If not adding cuttlefish, I add 1-2 honey dates – makes the soup even sweeter. keelong : Thanks! Happy cooking! Peanut turn out to still hard even after boiling for 5 hours. Any tips to advise so that peanut can be soft/tender? ps : Hmmm…that’s odd. What kind of peanut did you use? YingJie : Get the peanuts wherein the pods have been removed. It is light brown in colour. Noted, thank you very much! Cheer : That may be a bit too much. Double portion with 6 bowls of water may be preferable.